A rose for each word of the phrase “I love you”. 3 roses are a simple yet effective way to show someone of your affection to them in the early part of your relationship or to remind them at a later stage that your love is true. 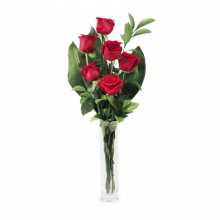 If the time has come to tell the person you’re longing for that: “I want to be yours” then 6 roses is the perfect bouquet to do it with. Show your special somebody just how much your admiration and desire for them goes. 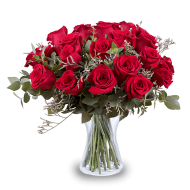 10 roses - You are a "perfect 10"
When you’ve found the person who is the perfect match for you then 10 roses is best bouquet to share with them. 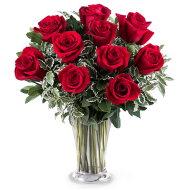 Show them that you think they are “a perfect 10” and more beautiful than anyone else with 10 exquisite roses. 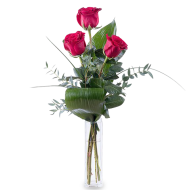 A dozen roses symbolise infinite love in the language of flowers. 12 appears often in mythology and culture and normally signifies a cosmic infinity and of course here that is no exception. Send 12 roses to the one for whom your love is limitless. Sharing a rose for each hour of the day shows your recipient that they are constantly in your thoughts (even as you sleep). 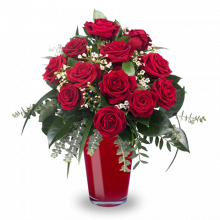 This is a bouquet that symbolises true devotion and is perfect to send to the one special person who is never far from your mind, even if you are far away from each other.